Spring/Summer 2016 is fueled by a sense of distinction. Individualism is at an all-time high. Women are tired of trying to be someone or something other than themselves, and are embracing a more accepting attitude. They want to achieve the best version of themselves, rather than an unattainable ideal. This season, unique looks were created for individual models at select shows on the SS16 runway – a testament to the heightened desire for personal expression. This exploration is expressed in two divergent movements. The first is a minimalist aesthetic that favors a sleek “no makeup” makeup look, relying on color correcting concealers and a light-handed contour to create an enhanced version of natural. The second takes a more maximalist approach, celebrating color whole-heartedly with bold strokes of the season’s biggest hues. These are featured below in the most indispensable color trends in cosmetics for SS16. Blue has been buzzing for a number of seasons, and SS 16 sees this cool tone gain even more momentum. A current societal preoccupation with water—from rising sea levels to floods and droughts—brings us face to face with aquatic influence. Splashing out around the eyes in shades of aquamarine and azulene, the look is clean and deliberate, with minimal makeup on the rest of the face. Waterlines are coolly defined in cobalt, or shaded with a single swipe of lapis. Jet-black mascara is upgraded with a slick of sapphire on lashes. Nails lighten up with playful, paler tints in robin’s egg and sky blue hues. On the runway at: Mary Katrantzou, Roksanda Ilincic, Monique Lhuillier, Missoni. Evolving from the shadowy darks of Fall/Winter 2015-16, intense berry tones ripen as the mercury rises, imbuing ethereal sundresses with an edge. Breaking with traditionally fun and flirty warm weather hues, this sultry femme-fatale style sizzles in the summer heat. A blend of burgundy, smoky purple, and a hint of brown combine to create this intoxicating and dramatic hue. Lips are deeply stained or perfectly defined in matte textures. On the runway at: Givenchy, Burberry Prorsum, Cushnie Et Ochs, Emporio Armani. 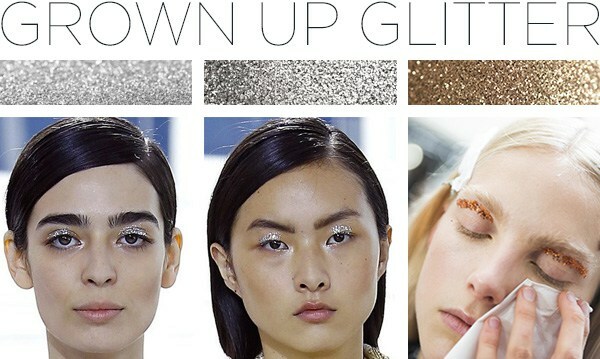 Glitter grows up this season, with futuristic touches of twinkling pigments and foil. While classic metallics like copper, silver, and gold are most prominent,a twinkling rainbow of shimmering hues is coveted as well. Execution is key, with carefully applied touches of the sparkly stuff on strategic areas around the eyes. A little goes a long way with this flash-forward look, ranging from a delicate row of gemstones to silvery lash tips. Nails take on a subtler effect, in whitened platinum and icy pearl polishes. Bringing a touch of lady-like glamour to the season, pink prevails with a sense of whimsy and fun. Women’s fashion has slowly transformed the rosy hue into a modern symbol of female empowerment, and beauty closely follows suit. Cool undertones root this season’s pink in elegance, toning down a girlish connotation. Placement remains classic on the lips, while also taking an adventurous turn, with bold washes on the eyes.